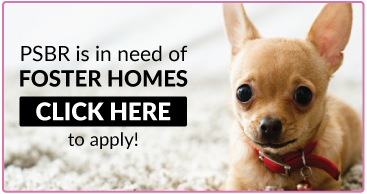 Applicants MUST contact their veterinary clinic IMMEDIATELY to authorize the release of relevant information about your pets to our Adoption Coordinator. Personal references cannot be members of your household (i.e. you cannot share an address with either of your personal references) and at least one reference must not be a relative. Who are you interested in adopting? How long will the dog spend alone on a daily basis? Have you adopted a rescue dog in the past? If so, where did you get the dog from? Do you plan to use a crate for training? Why or why not? What would you do if your dog bit a person or animal? What would you do if your dog had separation anxiety? How would you discipline your dog? How and how frequently do you plan to exercise your dog? What circumstances would cause you to return the dog to PSBR? By clicking the Submit button, I, the adopter, attest that to the best of my knowledge the above information is accurate and complete and I understand that falsely providing information can mean that my application will be terminated. Sending this application constitutes an electronic signature. If you have a question or are unable to complete the form for any reason, please email us!